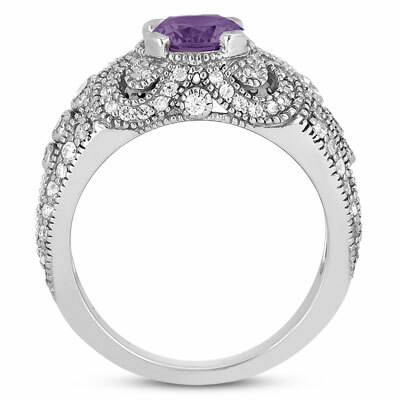 This vintage style amethyst and diamond ring in 14K white gold would look right at home on the finger of a princess, but it's just as fitting for any women with an eye for striking, feminine styles. 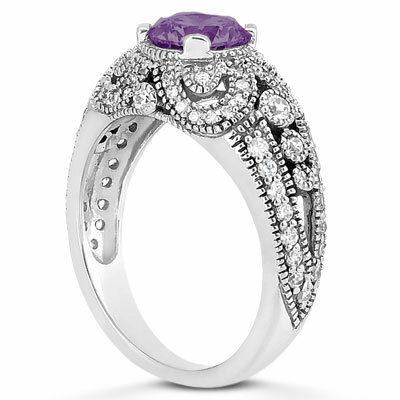 A sparkling round amethyst, 5mm across, gives this piece a dose of fresh, violet dazzle, while over 60 diamonds serve as accents as they adorn the band in a lavish vintage design. These stones are hemmed in by elegant beaded edges that emerge from the 14K white gold band. A dramatic purple amethyst is surrounded by 64 accent diamond for a carat weight of 0.39 carats in the vintage 14K white gold setting. 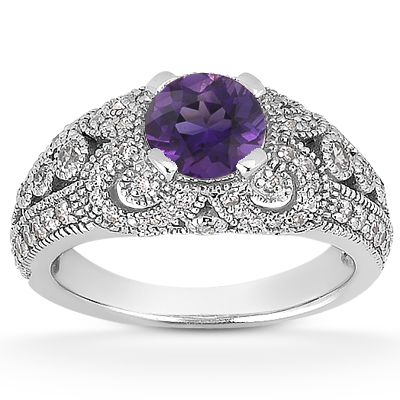 We guarantee our Vintage Style Amethyst and Diamond Ring, 14K White Gold to be high quality, authentic jewelry, as described above.